With Iran on a path toward normalizing relations with the United States and the US intent on reducing its burden in the Middle East, the responsibility of keeping Iranian ambitions in check has fallen to the Sunni heavyweights in the region: Saudi Arabia and Turkey. In leading Operation Decisive Storm in Yemen, Saudi Arabia clearly moved into the spotlight as a leader of the Sunni Arab world willing to back rhetoric with action in countering Iran. Turkey, meanwhile, has been more reserved in challenging Tehran, sticking to subtle methods such as backing Islamist rebel forces in Syria and deepening its economic footprint in Iraqi Kurdistan while working directly with the Shiite-dominated government in Baghdad. But Turkey is starting to feel overshadowed by Saudi Arabia. On the one hand, Turkey does not want to be a partner to Saudi Arabia, much less one of several partners in a Saudi-led coalition. It wants to assume the leadership mantle itself. On the other hand, Turkey’s highly polarized political environment makes it difficult for Ankara to engage in risky military action beyond its borders, reinforcing the perception that Saudi Arabia is the one taking action while Turkey stays on the sidelines. In trying to compensate for Turkey’s lack of participation in the Saudi-led military intervention in Yemen, Turkish President Recep Tayyip Erdo?an said it was intolerable to him that “Iran is trying to dominate the region.” This was an extremely rare and open-faced criticism of Iran by Turkey. Turkey has instead preferred to maintain a cordial relationship with Iran on the surface, even as the two countries compete on a number of battlegrounds. Erdo?an is still planning to visit Iran in early April, and both sides will keep up appearances to an extent. However, the regional environment will likely push Ankara into a more confrontational stance regarding Tehran as Turkey vies for a leading role in the Sunni world. 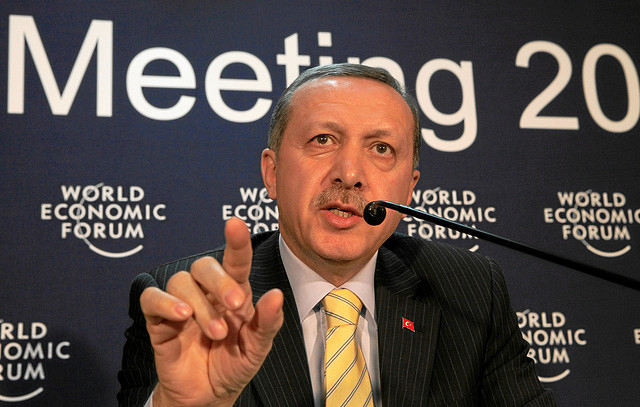 Turkey’s leadership credentials will still be in question, at least for the near term. Though Turkey is inching toward closer military cooperation with the United States in managing the Islamic State threat in Iraq and Syria, its vision for mainstream Islamist political factions to rise to power will naturally clash with a Saudi, Emirati and Kuwaiti imperative to prevent Muslim Brotherhood-style Islamists from challenging their governments. But Turkey is playing a long game in the region, knowing that Islamists in Egypt, Syria and the Gulf region will still be a political force to be reckoned with in the future. Saudi Arabia under King Salman has been more cognizant of this fact and has tried to reconcile with Qatar, another supporter of mainstream Islamists in the region. Turkey can take advantage of increased pliability in the Saudi position to engage with its Arab neighbors and offer selective cooperation in Iraq and Syria, where Turkish interests are concentrated. Turkey is a major component of a rebel training program involving Saudi Arabia, the United States, Jordan and Qatar. Turkey has also offered logistical support through Baghdad for a Mosul offensive and is in talks with the United States over flying armed Predator unmanned aerial vehicles out of the Incirlik Air Base. These are small steps, but Turkey’s military activity in the region will expand over time. For now, Saudi Arabia holds the reins in managing the affairs of the Middle East. Even with oil at $50 a barrel, the Saudis are still making a profit from oil production. Large cash reserves, along with military backing from capable Arab forces like the United Arab Emirates, give Riyadh the capability to reset expectations that the Gulf is made up of paper armies dependent on their U.S. patron. Even so, Saudi Arabia does not have an easy solution to a problem as intractable as Yemen. The military campaign in Yemen has displayed Saudi resolve in containing al-Houthi expansion, but Saudi Arabia is not going to be able to insulate the kingdom from the array of threats simmering to its south through an air campaign alone. Nor is Saudi Arabia prepared to risk a comprehensive ground intervention to neutralize the threat and occupy hostile territory. Ultimately, Saudi Arabia is likely to come to the negotiating table with the al-Houthis. That is precisely what Iran is hoping for. Stratfor received information that a backchannel negotiation between Iran and Saudi Arabia took place in Muscat, concerning Yemen. Oman, which opted to stay out of the military operation to preserve its neutrality, makes for an ideal conduit for such a discussion. It also proved to be a credible mediator in backchannel talks between Iran and the United States. Any negotiation between Iran and Saudi Arabia probably would cover such issues as al-Houthi withdrawals from Sanaa and Aden, resolution over armed forces loyal to former President Ali Abdullah Saleh and political concessions to the al-Houthis in a new government. In return, Iran could extract concessions from Saudi Arabia in Iraq and Syria. It is too soon to tell whether a conversation between Riyadh and Tehran could lead to a political compromise to de-escalate the Yemeni conflict or if Iran is even a credible enforcer for such compromise. The priority for Saudi Arabia will be to siphon off Saleh’s support for the al-Houthis to make Yemen a more manageable conflict rather than to concede to the Iranians in a broader negotiation. Nevertheless, even as Turkey and Saudi Arabia work in their own ways to counter Iranian influence, they are competing against each other for Sunni leadership in the face of Iran’s rehabilitation.